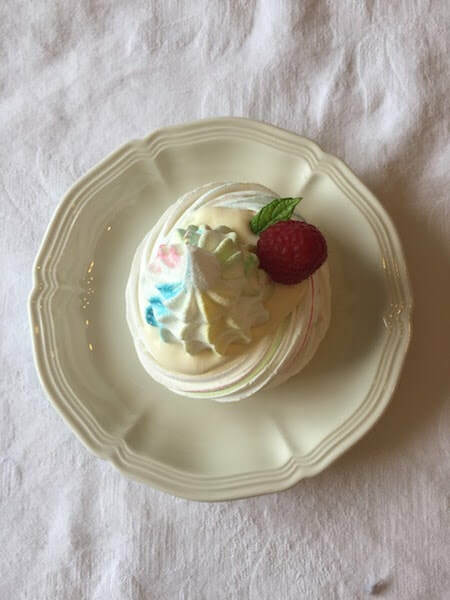 This is one of my "standby " recipes,if unexpected visitors arrive I can prepare a pudding in a matter of minutes as I always keep a stock of ready made meringues and nests. The fillings can be anything you wish. Two flat baking sheets ( it helps not to have a lip on baking sheets especially for biscuits, flans and meringues), lined with either baking parchment or silicon liners.i have bought two silicon sheets that are already marked with circles that are the right size for piping macarons but they work perfectly for meringue nests too. If you are using baking parchment draw 6 10cm circles to guide your piping. Place the parchment upside down on the baking sheet so the pencil won't be in contact with the piped meringue. Large piping bag ( you can use a disposable one) fitted with a JEM 1G star nozzle, or a plain round 2cm nozzle. A fine artists paintbrush bought specifically for culinary use , don't use one you have been painting with. Place the egg whites with the cream of tartar in the mixing bowl and whisk on medium until the mixture reaches soft peak stage, add the vanilla extract and turn the mixer up to high. Take a little mixture between your finger and thumb, it should feel smooth ,if it feels gritty beat the mixture a little more to make sure all the sugar has dissolved. Stand the prepared piping bag inside a large glass ( I use a pint beer glass but improvise), using the paint brush paint a line from the nozzle end of the inside of the piping bag towards the edge of the bag in the colours of your choice. Tip at this point if you are using parchment take a small amount if meringue and place a little on the underside of the parchment to stick the parchment to the baking sheet . Holding the piping bag vertically start at the middle of the circle guide and pipe around in a spiral shape until you reach the outer edge of the circle. When you reach this point lift the piping bag a little higher and pipe on top of the outer circle of meringue, do this 3 times to build up the sides of the nest trying not to take the flow of the nozzle away from the nest .When the nest is the required height quickly pull the nozzle away sideways to finish off neatly. Using a little cold water on your finger dap the last piped spot to create a smooth finish. Repeat this with all the circles refilling the piping bag when required. If you have any mixture left use the second sheet to pipe meringues for sandwiching together. Place the meringues in the oven and bake for 1 1/2 to 2 hours until the meringues are firm enough that they release easily without sticking . Turn the oven off and let the door be left ajar to allow the meringues to continue to dry out , two hours is usually enough but you can leave them overnight. Tip I place a silica bag or two that I get in bought items in the the container and they absorb any moisture, don't allow them to be in contact with the meringues. Either spoon the cream or pipe the cream into the nests. Just before serving sift a little icing onto each nest.